After e-commerce marketplace Flipkart, online travel firmMakeMyTrip.com has also announced an app-only travel sale. To be held till November 2, the getaway is providing offers and discounts across flights, hotels and holiday packages for customers to shop from.MakeMyTrip is the only Online Travel Agent in India to launch a large scale App Only Sale. MakeMyTrip said it has crossed 12 million app downloads so far with 1.2 million downloads in September. It claimed that traffic from mobile apps has grown 250-300 per cent year-on-year in the past few years. “The Great Indian Getaway is providing offers and discounts across flights, hotels and holiday packages. MakeMyTrip is expecting 5x traffic surge during the sale period and 15x surge expected during peak hours,” the company said. MakeMyTrip’s Great Indian Getaway is built on partnership alliances with exclusive participation of suppliers. 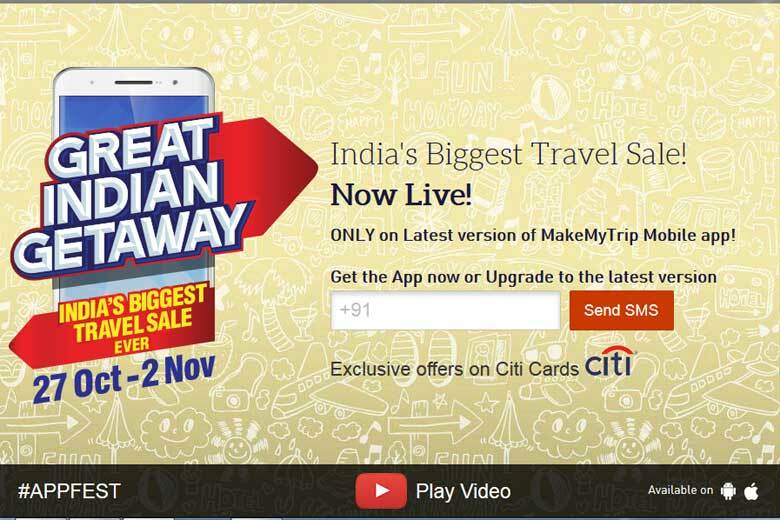 MakeMyTrip has partnered exclusively with Citibank to provide add-on benefits and exclusive offers to Citi debit and credit card holders. The company’s suppliers include several domestic and international airlines, leading hotel chains and resorts spread across the world. MakeMyTrip said unique visitors from mobile apps stood at 20 per cent in 2013, which grew to 33 per cent in 2014 and will soon reach the half-way mark. Mobile bookings contribute about 25 per cent of domestic flights-bookings and nearly 50 per cent of total online domestic hotel transactions, it added.